Vince Vaughn, soon to be married, stars in "Couples Retreat"
(OPRAH.com) -- We've always known -- and loved -- Vince Vaughn as a bachelor, on and off the big screen. 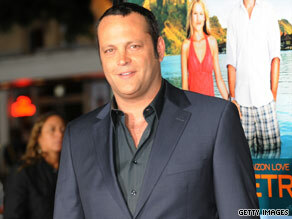 Vince Vaughn is looking forward to marriage and took the lessons of "Couples Retreat" seriously. These days, however, the man we knew is all grown up. He's traded in appearances in the tabloids for a very private engagement (he's talking about kids! ), and he's headlining a film that explores the trials of marriage and family. Rachel Bertsche: The pairs in "Couples Retreat" have really relatable, I've-been-there sorts of problems. You've never been married, so how did you manage to accurately portray the different ruts that married couples fall into? VV: Thank you. I met her through a close friend of mine's wife -- my fiancé is her best friend -- so it was a really nice way to meet someone. I started thinking, "What really makes a relationship work?" So my thoughts for this movie went to, "I've seen a lot of movies that are just about one relationship, but what about the dynamic of couples?" So I said, "Let's take some relatable people -- I set them in the suburbs of Chicago -- who get to go to an exceptional location. Give them common problems, a familiar group dynamic, and send them to a place that's supposedly full of experts on couples." RB: Now that you're engaged, are there any lessons you're taking from the film in terms of what you want to do -- or don't want to do -- as a husband? VV: The one thing I like that we say in the movie is that it's not like you're going to solve everything. You're not always going to learn to love doing the things you don't want to do. What I really like about the couple that I'm in with Malin Akerman is that they are seemingly succeeding at life. They are fortunate enough to have good jobs, and they're making their kids a priority and taking them to activities and everything. They don't think they have any problems, and then when they get to the retreat they realize, like a lot of couples that have kids or regular relationships with the obligations of life, they as a couple start to come in last. They're not spending any time just being friends or laughing or enjoying each other. You start to see that person as a source of obligation. So what I would take from this movie is that it's important to make sure you do something fun with each other every now and then. Because before there were the kids or the house or the mortgage or any of it, there were these two people that really wanted to be around each other, so don't spend that time not having fun. RB: Such a nice thing about the characters that you and Malin play is that they don't get tempted to stray. They are quite clear that they want to be loyal to each other. It's refreshing. VV: Yeah, it was kind of nice to make a movie where it was like "We made a commitment. We're in this 'cause we said we wanted to be, and we have people counting on us. You know what? We believe in this and it's worth it to us, and I love you." VV: It was an idea that I originally had, then Favreau did the first pass at it and then he went to the "Iron Man 2" stuff and so Dana Fox, who's a great female screenwriter, she and I really took over the screenplay and finished it together. RB: You and Jon have been in plenty of films together -- both behind and in front of the camera -- perhaps most notably "Swingers" and "Made." Those are both big-time bachelor movies, so it seems you're moving into this next phase together. What was it like making that transition? VV: Just as your priorities change as you get older, so do the subjects that have you interested. "Swingers" came out of Jon moving to California. We had become friends on "Rudy," and I started taking him around to underground swing scenes and swing bands that I like. So he wrote an overexaggerated comedic movie based on him getting past a relationship. The story with "Couples Retreat" was the same thing. As I started thinking about going to the next place in my life with kids and marriage, it was just on my mind. I think our films really reflect what is going on in our lives. RB: You say the films reflect where you are in life. Do they accurately portray the friendship between you and Jon? I read that he took some of the dialogue in "Swingers" directly from you. VV: Well, you know, it's a comedy. So you'll say, "You're money, baby" 20 times in order to make it funny. It's not as if in regular conversation I'm saying that all the time. All of us have a lot of sides to ourselves, but the fun thing about being actor is you make one side predominant for the character you're playing. So the fun in this movie is that I get to be the more grounded guy who's on this journey, and then the fun in "Wedding Crashers" was that I got to be the crazy guy. RB: So what's up next for you? Any big movies or projects we can look out for you in? VV: I don't have any immediate plans. I'm hoping to take the rest of this year off. I'll be home in Chicago in November and look forward to having some downtime there until the end of the year. Then get out in January and February when the cold gets too much. VV: Yes, and that too. By Rachel Bertsche from Oprah.com © 2009 Harpo Productions, Inc. All Rights Reserved.